Is your home’s bed frame loose or not firm?It is now possible to install a fixed bed frame at home and it is easy to operate. – Thicken design for more weight bearing and higher firmness. – 6 packs, 48 screws, 4 enough to fit one bed, and two can be replaced. The combination of accessories is directional, please install according to the picture. 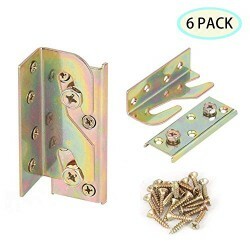 CONSIDERATE SERVICE — You will receive 6 pack of bed frame bracket and 48 matching harden screws at a worthy price. QUALITY MATERIAL — Made of heavy duty Galvanized Steel, surface mount bed rail fittings offer more weight bearing and higher firmness. Sturdy and durable for connecting bed frames. EASY TO INSTALL — No need to do mortise. Just install directly. Full screws locking tightly with no shaking and no sound. INVISIBLE ACCESSORIES DETAIL #4 — Angle pieces:3.38 X 1.04 X 1.3 inch(86mm*26.5mm*33mm); Flat pieces:3.58 X 1.22 inch (91mm*31mm); Thickness: 0.078inch(2mm).